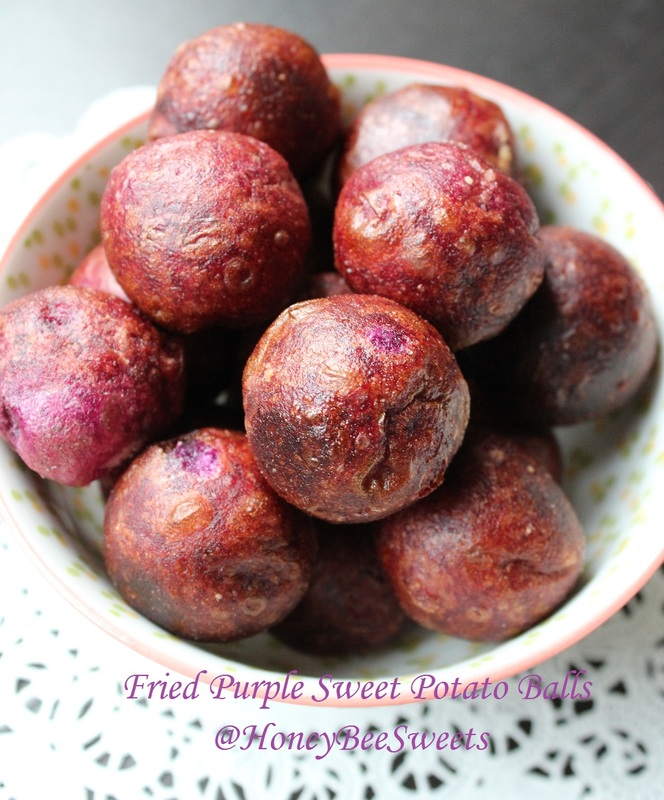 Fried Purple Sweet Potato Balls (炸紫薯QQ球) and Happy 2013! 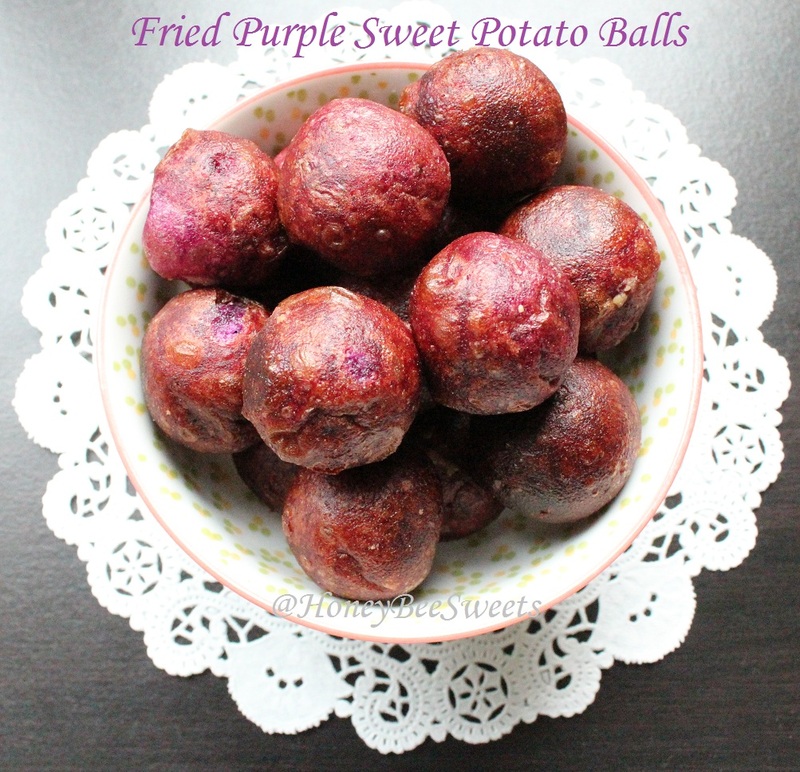 I know the usual fried sweet potato balls are in a nice golden colour...but mine are just ehh....purplish-brown?! Okay, it probably seem like a bad idea to use purple sweet potatoes here...but I reckon why not break from the norm? It won't hurt to be a little more adventurous no? In a large mixing bowl, mash the still warm sweet potatoes together with the sugar. Add in the rice flour, cake flour and corn flour and mix well. Knead everything together until it comes together to form a soft pilable dough. Weigh the dough into 15g each and roll round with your palms, continue till all has been rolled. Remove from hot oil and let sip over paper towels. 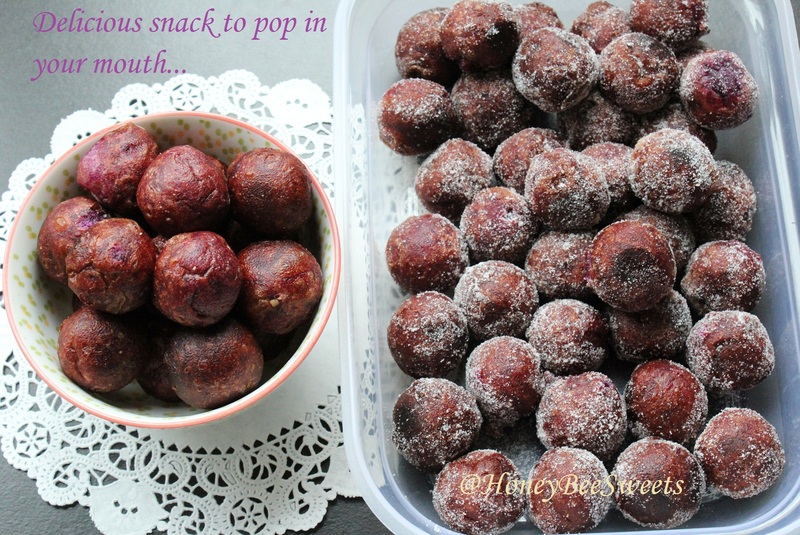 Since my sweet potato balls were not sweet enough, I ended up rolling them in fine caster sugar after frying them. You can skip this can just add more sugar into the dough. The texture of these balls was just as expected! Crunchy good on the outside and soft chewy interior was really yummy! I made this for a family BBQ gathering and it was very well received. ;) This is truly an "old-school snack" as my MIL love it the most, haha! Before I sign off, I want to wish everyone out there a very HAPPY 2013 ahead! Although the new year may be full of new challenges, but I believe that as long as one puts their heart to it, each hurdle will just be another experience that will build a stronger you. So stay strong and healthy my friends! Peace! 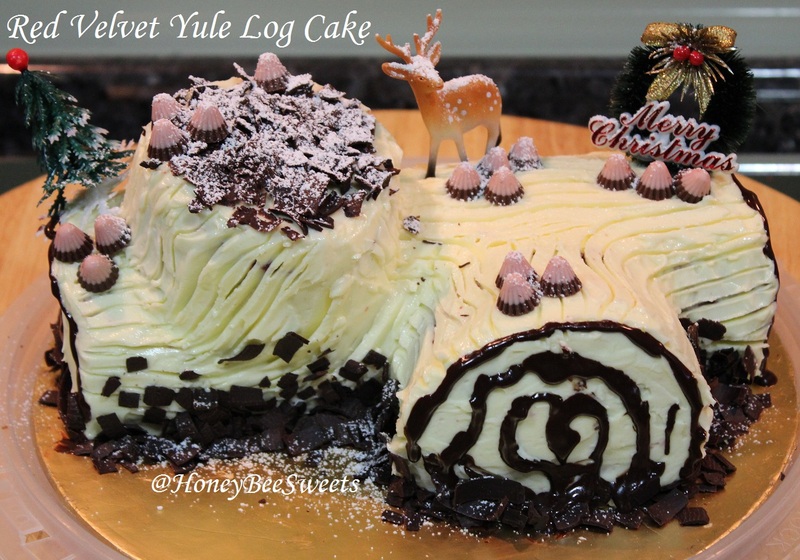 Although Christmas has already past, but I reckon that I best post up this fabulous red velvet Swiss roll log cake recipe for future reference. I hope everyone had a fabulous Christmas celebration...and got their desired Christmas present! I know I did! Will elaborate on that on my coming pot. ;) For now...the Red Velvet Yule Log Cake. This recipe is the "bomb", I can eat it everyday, haha! I actually made these cuppies for my kid's form teacher awhile back and she loved it too. 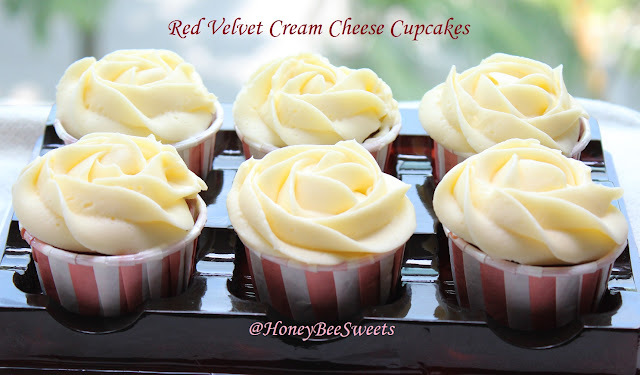 ;) And remember I actually used it in my mum's birthday cake: Red Velvet & Light Cheese Cake with Pink Ombré Roses. 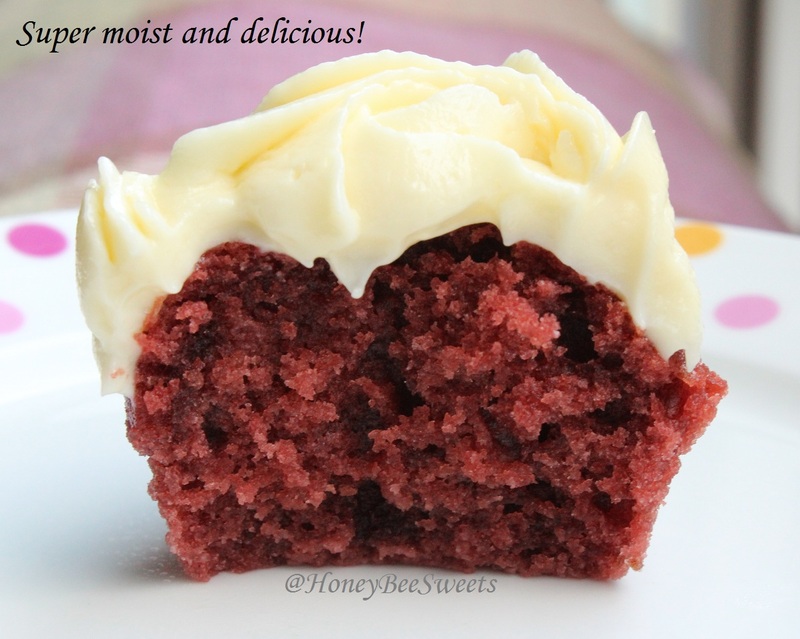 - Mix cocoa powder and hot water together to form a thick paste. Let cool for use later. Using the double boiler, place a mixing bowl over it. Add in the egg yolks and sugar. Beat the mixture till it thickens and double the volume. Remove from the boiler and stir in the cocoa mixture. Also add in buttermilk, vegetable oil, vanilla extract and stir gently till well combined. Then add in the red food coloring and white vinegar and combine well. Lastly add in the sifted cake flour and gently mix in till well combined. Preheat the oven to 170C and lined and grease the baking tray with parchment paper. In another clean mixing bowl, beat the egg white till foamy and gradually add in the caster sugar and beat till stiff peaks. Gently fold in the whites to the egg yolk batter in 3 separate portions. Remember to fold in gently and not deflate the batter. Pour the batter on the prepared tray and spread evenly. Bake in the oven for 15 minutes till done. Once the cake has cooled completely, spread about 1/3 of the cream cheese frosting on the surafce, evenly, leaving about 1" at the edge so as to have a cleaner edge when rolled up. 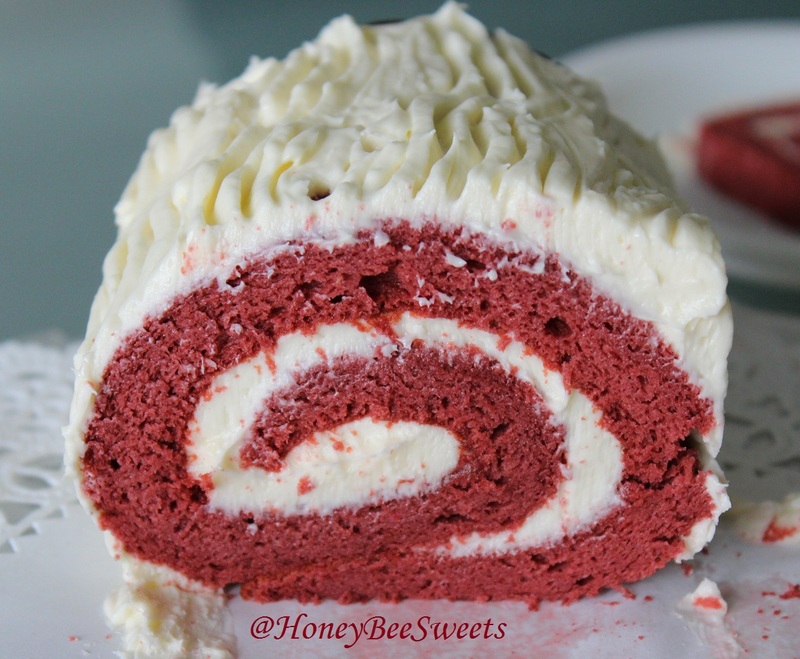 Roll the cake from the longer side inwards. 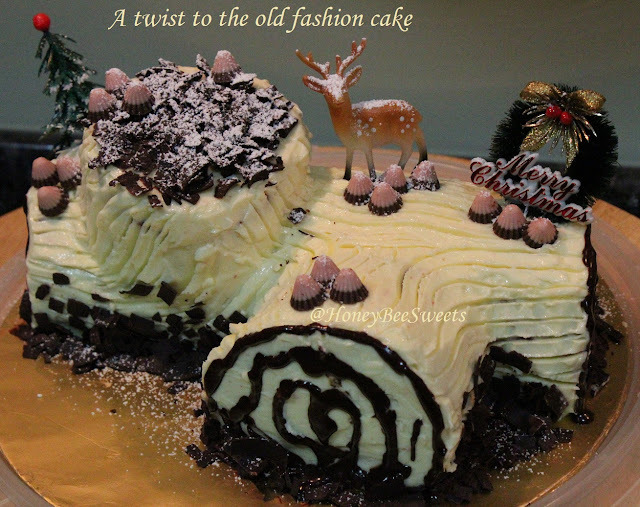 Trim the sides and slice portions of the cake as desired to make different log segments. Frost the cake till all is covered and use a fork to run through the frosting to create the log texture. Decorate at will! Chill as per needed so that the cream cheese frosting is more stable. I actually made the same recipe twice....and both occasion was a success! 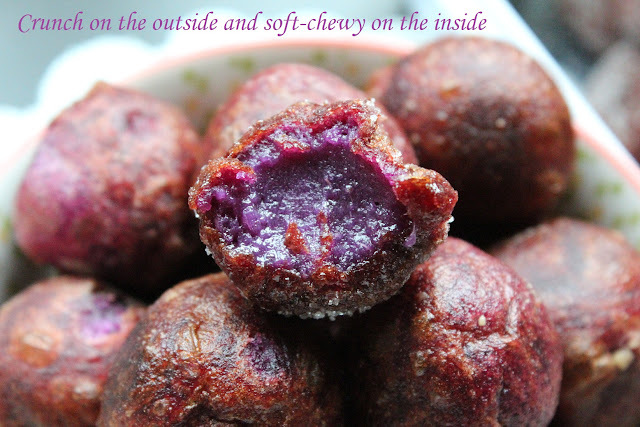 My friends raved about it and even her 5 year old daughter (picky eater) had seconds! 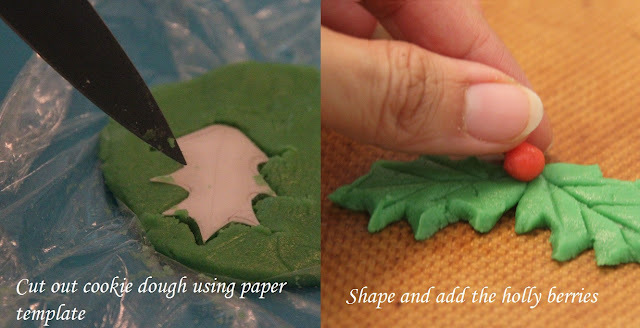 I am going to submit this to Aspiring Bakers #26 - Creative Christmas Motif Bakes! hosted by Alan of Travellingfoodies. 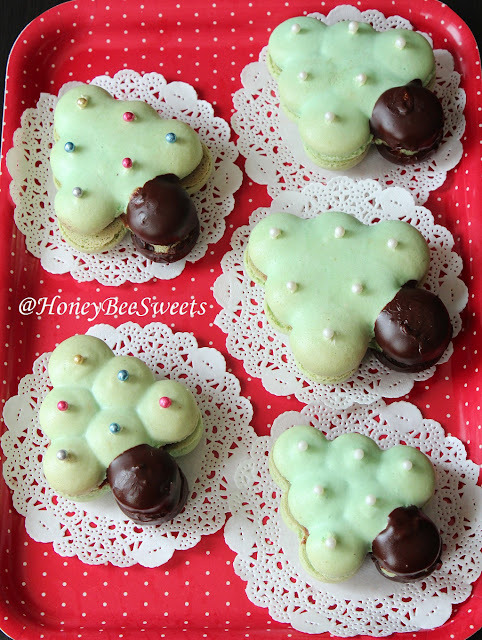 Christmas Tree Macarons & Merry Christmas! For the past week, my daughter has been very excited about the arrival of Christmas Day. She had even written a letter to Santa, requesting for a nice Christmas present (a giant bubble blower...whatever that means) and said she has been a good girl for the longest time. Among all these excitement, she has not forgotten to play good hostess. She said it is a must that we prepare cookies and milk for Santa when he comes deliver the presents on Christmas night. If we did not prep any cookies, she claim that Santa will be very angry and will not give her the presents. Gosh! The books and programs she's been watching! Well I did played along with her of course, since it is fun for the kids to have a little hope and fantasy. Believe me, we even made my kids believe there is tooth fairy! Lol! Anyway, I was gonna keep things simple by baking a batch of butter or oatmeal cookies. But when I asked my girl what is her most favorite cookie in the whole world...she said macarons. (I had to ask...);P I played with the idea and then finally decided to make it anyways. And to participate in the AB this month, I piped it into Christmas tree shape! In a blender, finely ground the almond powder and confectioner's sugar together till powdery like. Then pour it into a bowl and add in green food coloring or green tea powder. Then mix in the egg white and salt. Stir and mix well. Mixture will be thick. Scoop the batter into a piping bag with an 10mm nozzle. Pipe out on a baking tray lined with baking parchment paper into seven 20cents coin size circles which forms a Christmas tree. Let rest the batter till it doesn't stick to your finger's touch. Preheat the oven to 150C with fan off. Bake the cookies in the preheated oven for 14mins. Melt the chocolate in the microwave and let cool for a minute before mixing into the room temperature buttercream. 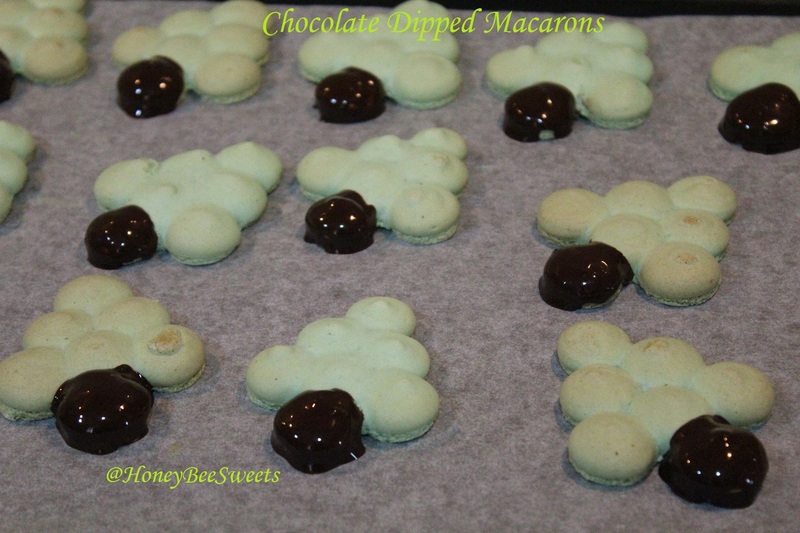 Melt about 40g of dark chocolate and dip the ends of the macaron cookie into it. Then let it cool to set. 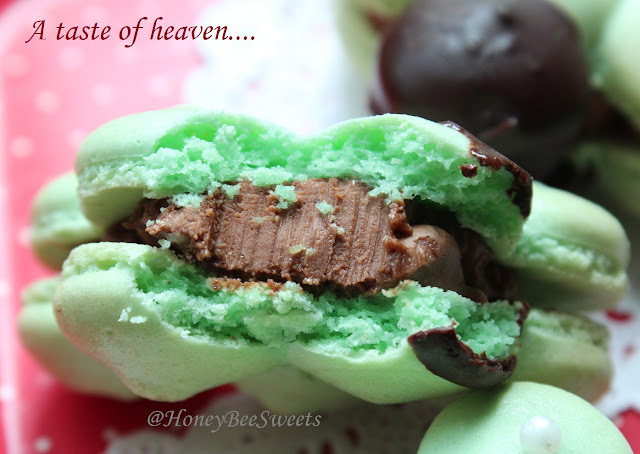 Once the chocolate has set, fill macarons with the chocolate SMB and sandwich with one more cookie. I really enjoyed myself when I made these macarons, so fun! So perhaps you can try it out and get into the festive mood! Go, there's still time, hahaha! I would like to take this opportunity to wish all my friends and readers out there a Merry and Blessed Christmas! 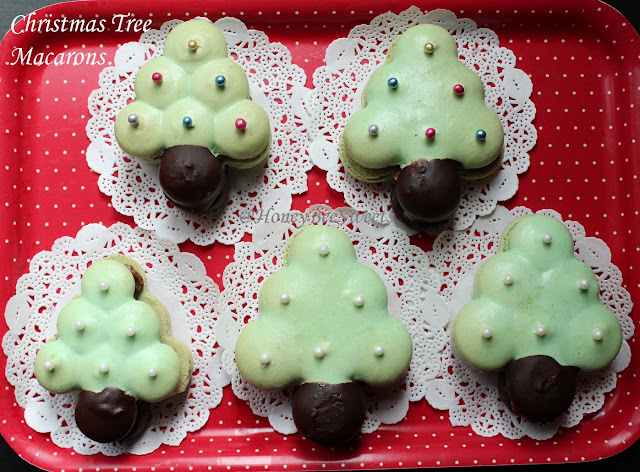 I would like to submit this post to this month's Aspiring Bakers #26 - Creative Christmas Motif Bakes! hosted by Alan of Travellingfoodies. Thanks for staying with me folks! Okay, I know, but it sounds and look almost the same as last year, haha! But I guarantee you, this is equally delicious but much more wholesome! With the addition of rolled oats, it not only add on the wholesome goodness, it gives it that distinct texture (which I so love) and fragrant when you chew on it...delish! In order to join in this month's Aspiring Bakers, I added the extra Christmas Holly butter cookies as part of the deco on the wreath. :) Why let a good post go to waste? Haha! Okay for the butter cookies, please kindly refer to the recipe here. Tint your cookie dough as desired and chill. Then merely use a paper template (self made) and cut out the cookies with a knife. 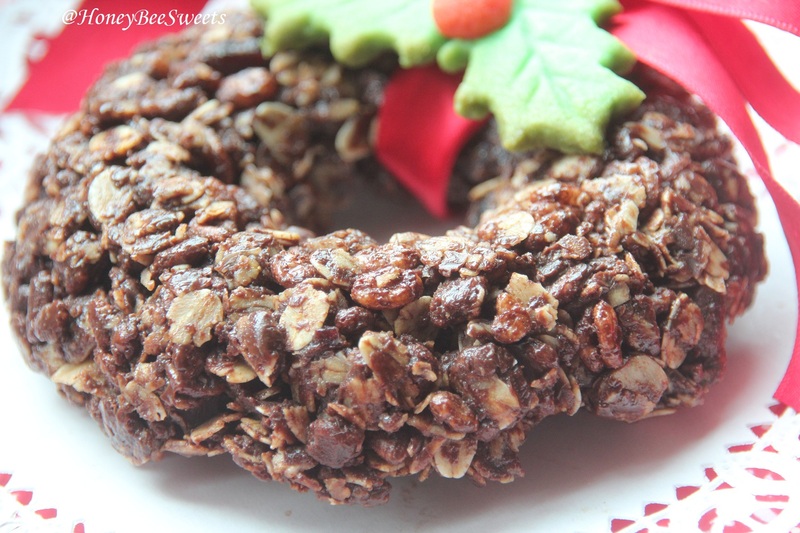 Stir the chocolate rice crispies, oats and dried fruit(if using) in and make sure all are coated. A close look at the granola....loads of texture and goodness. 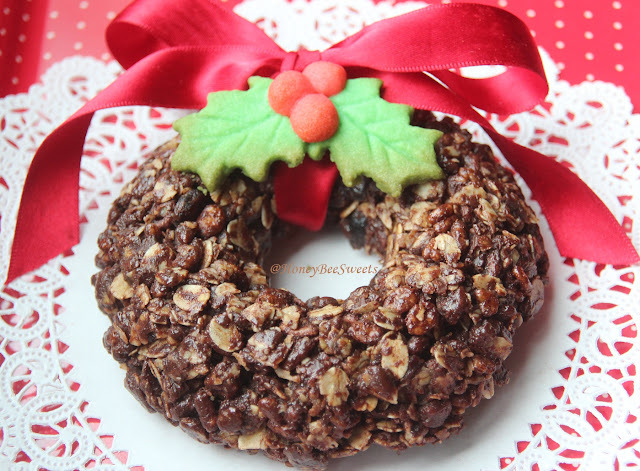 It has a wonderful crunch from the rice crispies, slight tartness from the dried fruits and chewiness from the oats. Best of all, a rich chocolaty taste. Yummy! Remember to use quality chocolate to make this...every bite counts(calories)! 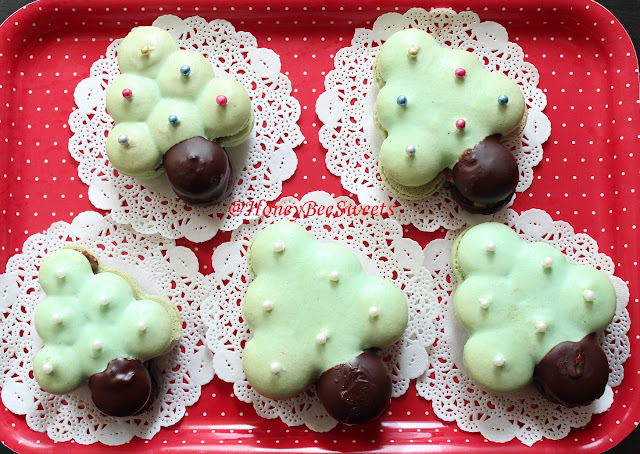 I am happy to submit this post to this month's Aspiring Bakers #26 - Creative Christmas Motif Bakes! hosted by Alan of Travellingfoodies. Okay, hope you all have a good week ahead! Talking about Christmas Tree, I got in the festive mood and baked a Christmas Tree too! 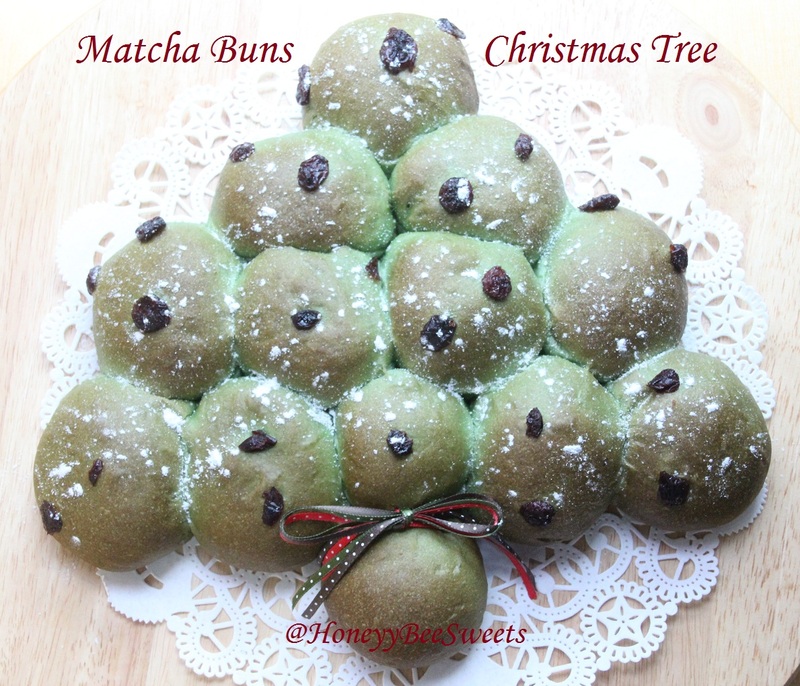 A tree made from Matcha (green tea) soft buns, dried cranberries and sweet red bean paste filling. It was fun making it! In a mixing bowl, add in bread, wholewheat flour, matcha powder, sugar, salt, water, egg white and yeast. Mix well till it comes together to form a pilable dough. Continue to knead till it is not sticky and pulls away from the mixing bowl. 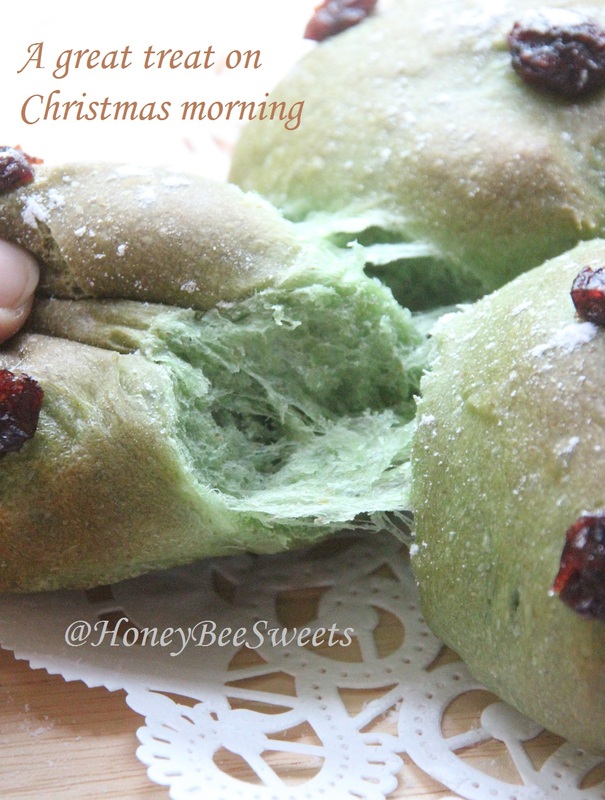 Add in butter (and green food coloring if using) and continue to knead till it reaches window stage. Cover dough and let proof at room temperature for 2hours or till it doubled in size. 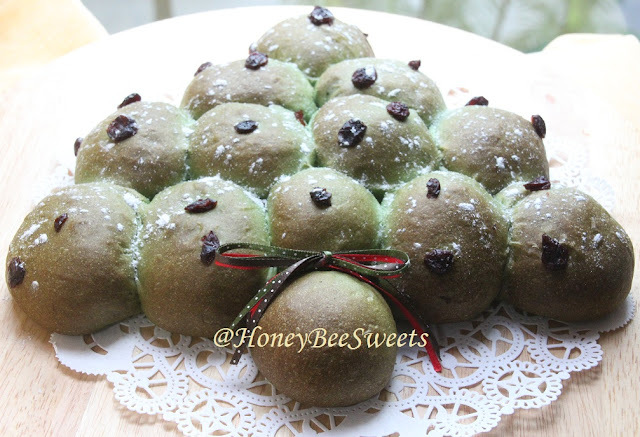 Flatten each dough portion and place about 15g of red bean paste in the center. Close and seal nicely. Roll round and lay it on a baking pan laid with parchment. Repeat for the rest of the portions till all is filled and rolled. Remember to assemble your tree as you go along. 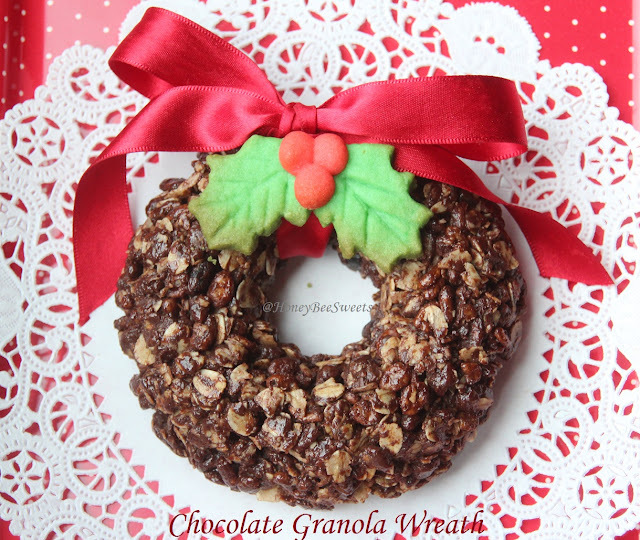 Brush the dough surface with some egg white/water and press on some dried cranberries as decorations. Let proof for anothwe 30 minites covered. Bake the tree in the oven for 15minutes or till it is golden brown in colour. Remove from oven and let cool before serving. I am happy to submit this post to this month's Aspiring Bakers #26 - Creative Christmas Motif Bakes! hosted by Alan of Travellingfoodies. Thanks for hosting Alan! 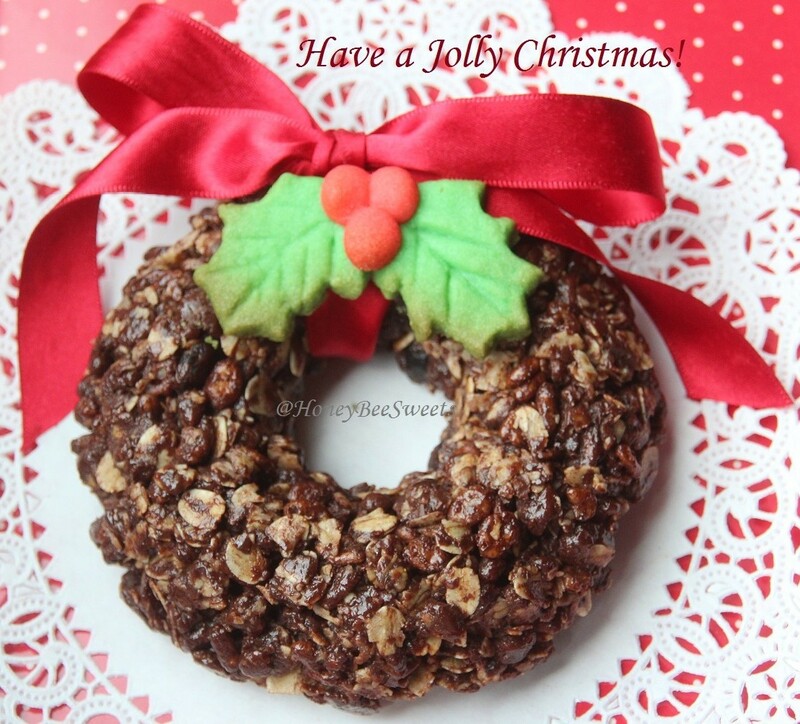 If you have not made anything for this month's AB, get in the kitchen now and join in the festive fun! Okay, hope you all have a wonderful weekend! Cheers! Okay, I have to admit mine looks a little ugly...wrinkly and a wee bit browned surface. :P I guess my oven temperature should have set a little lower. But overall the taste was pretty satisfactory, better then I expected because it was my first attempt, haha! In a large mixing bowl, add in the cake flour, powder sugar and salt. then using only your finger tips, work the cold butter into the flour mixture. Alternatively, use a mixer to combine the ingredients till it resembles bread crumbs. Next add in the egg yolks and gently work the dough but not over kneading it. Over kneading the dough will make it hard and not flaky. Chill the dough in plastic wrap for at least 30 mins till ready to be used. 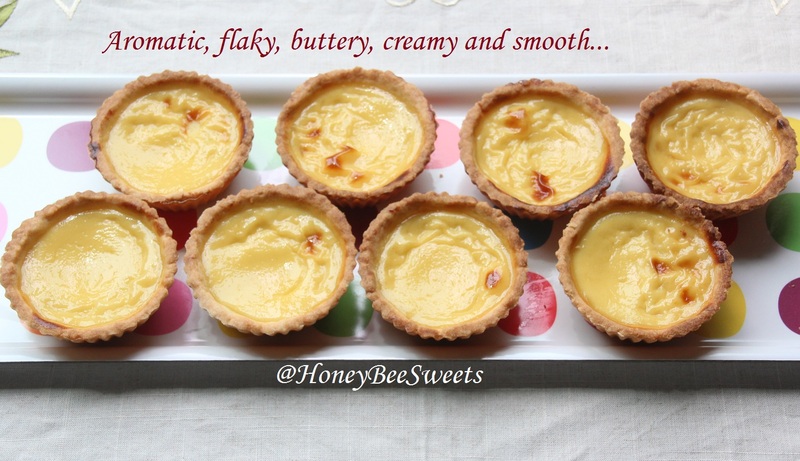 Grease the mini tart tins. After chilled, take out the dough and divide the dough into 8 equal portions, about 33~34g each. Roll out each dough portion into a circular disc about the size of the tart tins. Then use your fingers to gently press in the pastry dough to shape it nicely to the tin shape. Repeat till all the pastry doughs has been shaped into the tins. Put them in the fridge until needed. Proceed to make the durian filling. In a saucepan, add in durian flesh, water, sugar and salt. Turn on the fire to low and stir to cook mixture till the sugar has melted and durian flesh has disintegrated. Strain the mixture leaving only the fibers and membranes of the durian flesh. Stir in the milk, condensed milk and egg, mix well. Again strain mixture. 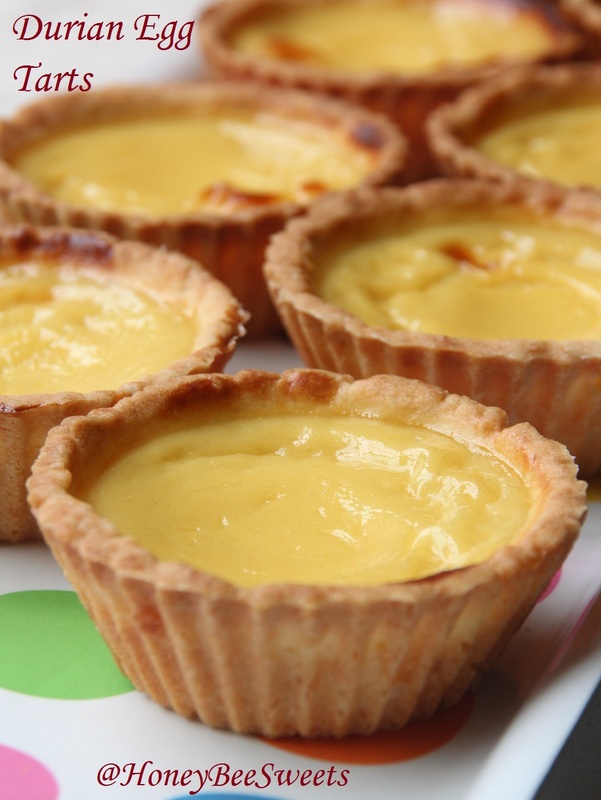 Divide the custard filling equally among the chilled pastry tart shells. Bake in the preheated oven for 18-20 minutes till the custard it slightly firm to the touch or not wobbly. The pastry crust is as expected, flaky, sweet and buttery. 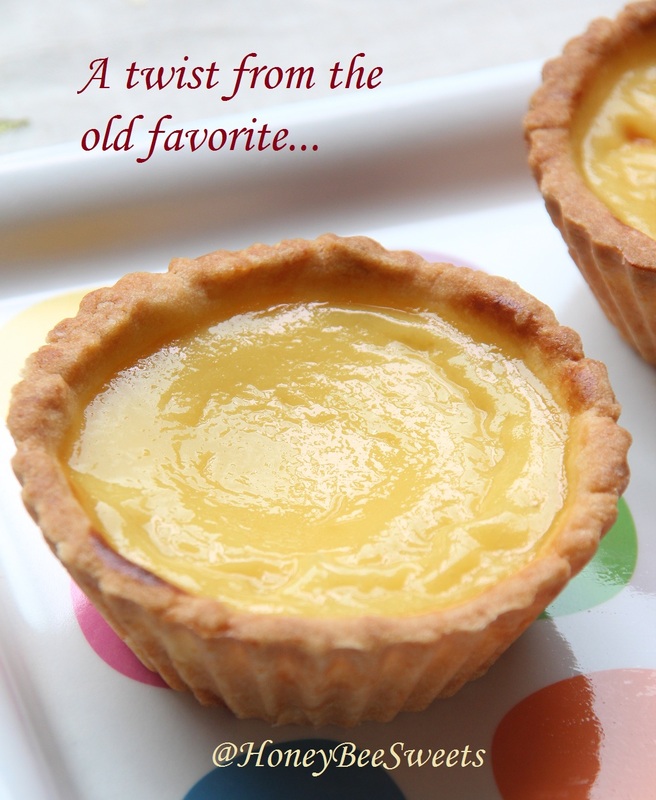 With the smooth custard durian filling, it was good. 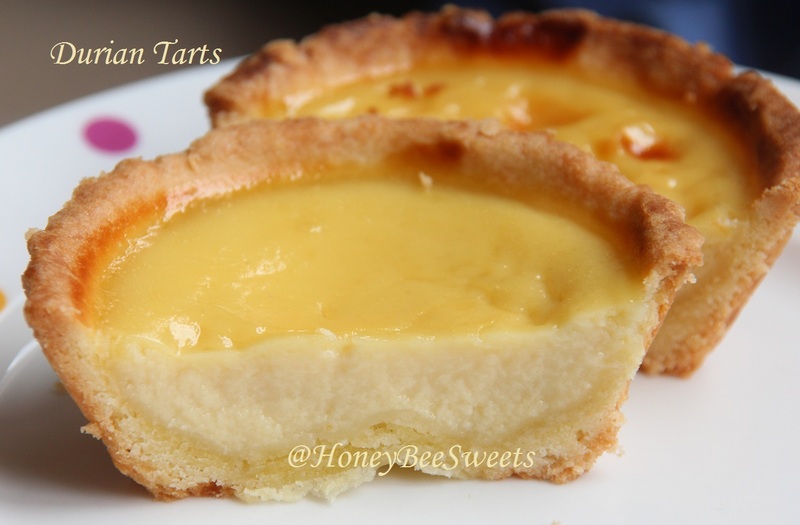 Hope this post has whet your appetite on baking some durian tarts for yourself. It is really quite simple to bake up now that I think about it. ;) Do try! Have a good day all! Will be back with a Christmas post next! Cheers! As always, when I have over ripe bananas at home, I will always try to look for new banana recipes to try out. Not that I have no favorite old recipes to fall back to, just that I believe like everyone else, it's nice to explore and discover new interesting ways of incorporating this versatile fruit into bakes. 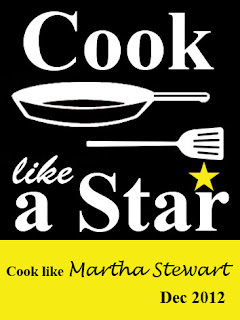 I happen to stumble upon this great recipe on Martha Stewart website which seems to fit the bill. It uses wholewheat flour and vegetable oil which seems pretty healthy, so I'm sold! It was easy to fall in love with these muffins. Why? It taste soft and delicious, bursting with banana flavor and it won't bust your weighing scale even if you down a couple more. Hahaha! 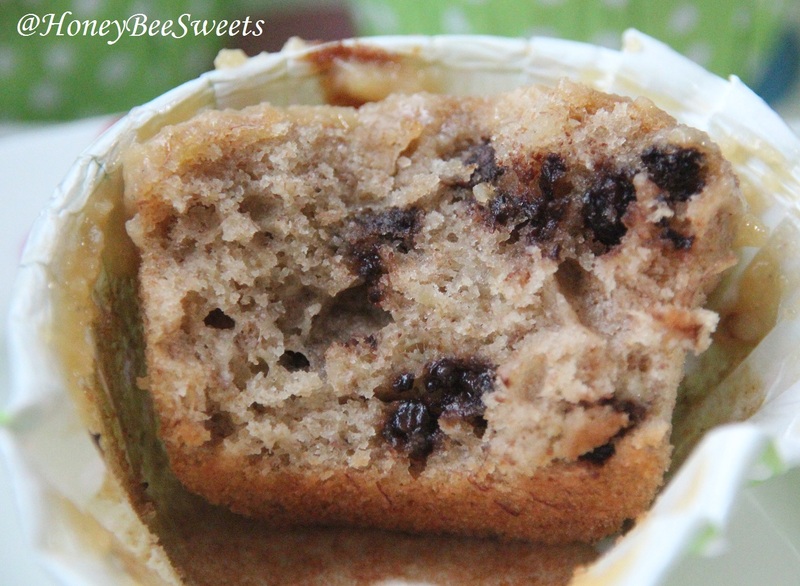 I also added a cup of mini chocolate chips into the batter (why not?!) which makes it even better. 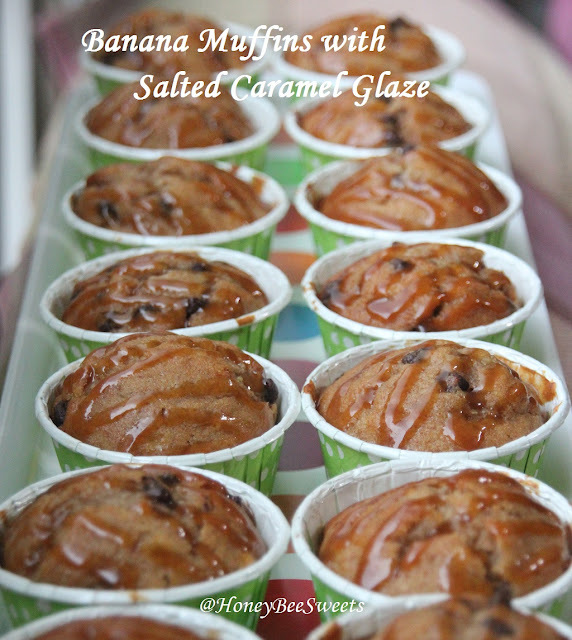 To kick up another notch (like Emeril Lagasse always say), I added salted caramel glaze over the muffins.....heaven! So who say a simple old banana can't be a wonderful sweet treat after all? I made some changes to the original recipe, here is my version. Alternatively, click here for original version. In a small saucepan over medium heat, combine sugar, water, corn syrup. Cook mixture until it begins to bubble. Bring the mixture to a full boil and cook until it becomes dark amber in color and smells like caramel, about 6 minutes. 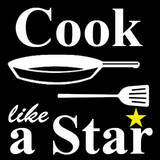 Remove saucepan from heat and carefully whisk in heavy cream, butter and sea salt. Allow caramel to cool down for 15 minutes. Lastly, stir in the vanilla extract and sea salt. Use immediately or cover and store at room temperature up to a day. Preheat the oven to 175C. Line 12 muffin liners. In a large mixing bowl, add in the 4 banana flesh and mix with the paddle attachment. Beat until mashed, about 1 minute. Add brown sugar, oil, and egg; beat until smooth. Reduce speed to low. Add flours, baking powder, baking soda, and salt; beat until smooth. Add milk vinegar mixture and vanilla; beat until combined. Lastly, stir in the chocolate chips till just combined. Fill muffin liners three-quarters full. 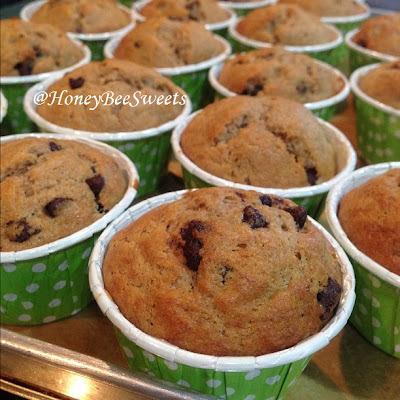 Slice remaining banana into 1/8-inch-thick rounds; place a slice on each muffin. Bake until tester inserted into center comes out clean, about 25 minutes for regular muffins and 20 for mini, rotating pan halfway through. Transfer to wire rack to cool. Store, covered, at room temperature. 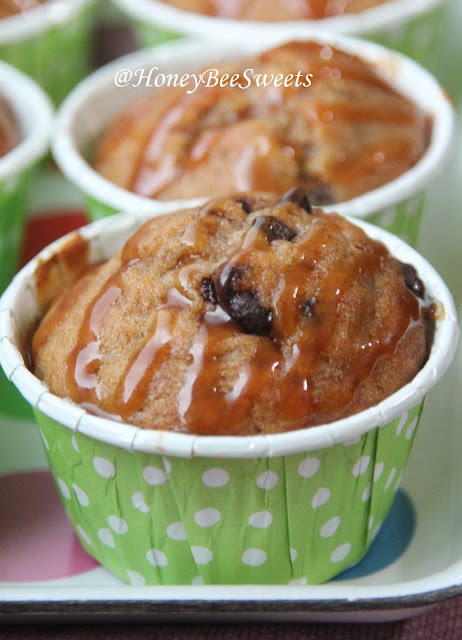 Once the muffins are cooled, drizzle the caramel glaze over the top. 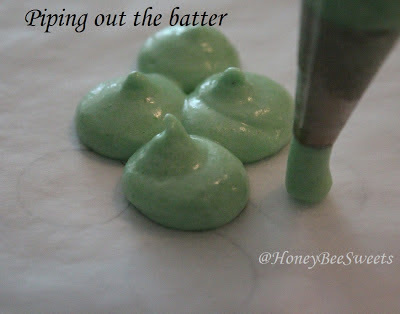 You can use piping bags or squirt bottles to do that. Since I did reduce the amount of sugar, the muffins were just right with the chocolate chips and the salted caramel. Each bite is rich banana aroma, chocolaty, sweet caramel with a hint of saltiness. I simply adore it! Okay all, got to run again. Have a great weekend! This is my first time baking polo buns. I got this recipe from one of the book I bought in my holiday. "Handmade breads 手感烘烤；台式经典面包". This book is filled with new and fun ideas on shaping buns and exiting polo buns flavors. ;) Do look for this book if you are a bread baker fanatic like me. ;) By the way, if you are puzzled why these buns are called polo buns, here is what I understand. 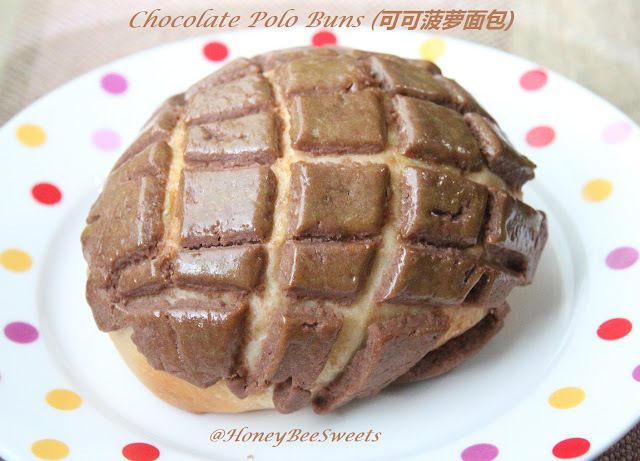 Polo buns are made popularized in Hong Kong. And the word "polo" means "菠萝" pineapple in Cantonese. And the "polo" refers to the buttery crunchy crust on top of the buns. Yums! Divide the dough into 15 equal portions or 60g each portion. Cover and let rest for 20 minutes. In a large mixing bowl, beat the butter and powder sugar together till light and creamy. Add in the beaten whole egg slowly as the mixer is till going. 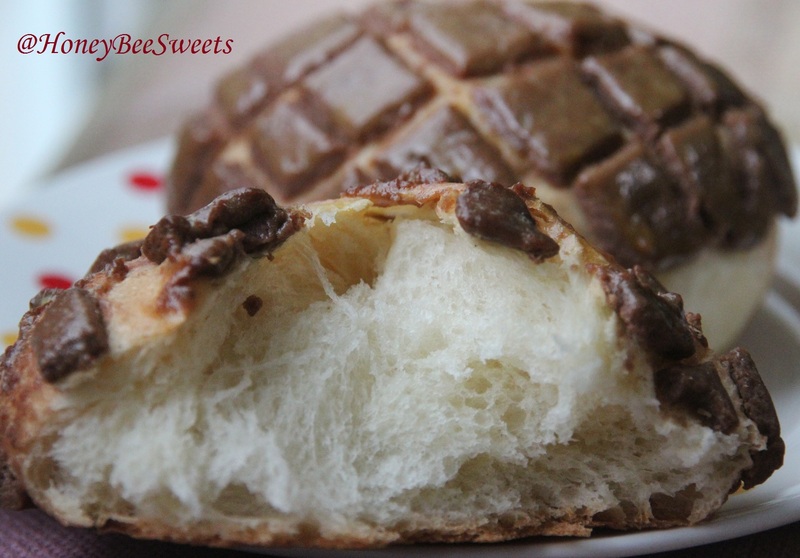 Add milk powder and 250g bread flour to the butter mixture and mix well. If the mixture seems a little too oily and soft, add in another 10 to 25g more of the bread flour till it is easier to handle. Lastly add in the 10g cocoa powder and knead it well till well combine. And not to over knead the mixture too which will also result in a hard polo crust. Divide the polo mixture into 15 equal portions or 30g each. Roll each portion till it is big enough to cover the whole top of the proofed buns. Gently place the polo top over the bun and make checkers markings. Repeat till all the dough and polo portions are used up. 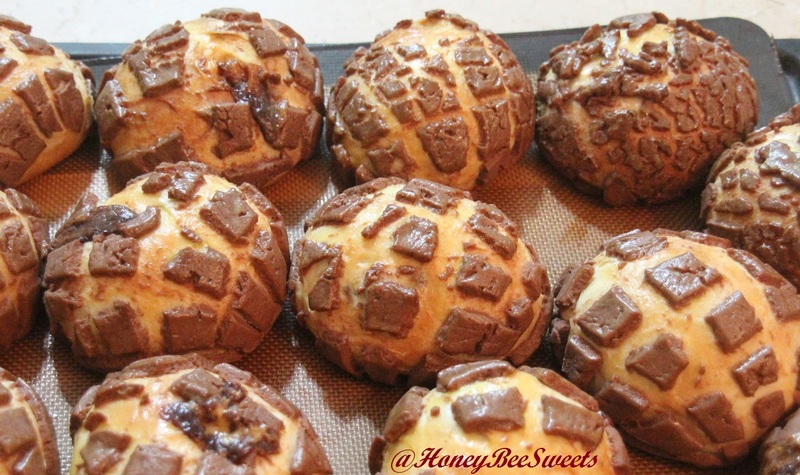 Brush the polo buns with egg wash and bake in the preheated oven for 10 minutes at 175C, then reduce the temperature to 160C and bake for another 6 minutes till golden brown. Remove from oven when done and let cool completely before serving. Okay all, got to go. Hopefully I will be back real soon!